← How is North Korea responding to climate change? It looks like we overlooked some critical information when writing the article about potential DPRK-PRC conflict in Korea Bay. 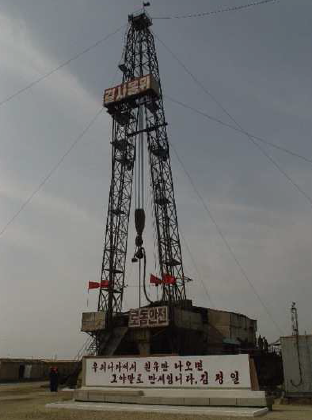 An associate of ours over at our partner research blog Sino-NK pointed out that HBOil had not, in fact, acquired the rights to the Korea Bay oil wells. However, this does not mean that all of our analyses are suddenly irrelevant, it just means that any conflict in the region would not be over potential rights, it would be over existing contracts, perceived inequities, and politicization of business relations. After digging a little, it turns out we missed a vital HBOil presentation slide set on their website. Slide 19 mentions that the production sharing contract for West Korea Bay is actually held by the Chinese National Offshore Oil Corporation (CNOOC), the same state-owned group that is currently drilling off the coast of Vietnam. Americans may remember the group also from a slight controversy over Gulf of Mexico oil well contracts. Obviously this means that there will not be an immediate conflict over the oil deposits in Korea Bay with the PRC throwing its weight around to secure the drilling rights. This means that the PRC has apparently forestalled potential future conflict by keeping the area within DPRK sovereign maritime territory while winning the rights to the deposits for CNOOC. But the DPRK and PRC have had some rough patches when doing business in the past. Though, as we discussed in in the previous article, PRC-DPRK issues are not aired publicly, in 2012 the PRC company Xiyang had a public falling out with its DPRK associates. Xiyang claimed that the DPRK had essentially sabotaged their operation and possibly used the whole joint operation as an opportunity for a hostile tech and knowledge transfer. The DPRK claimed Xiyang was hostile to the government and had to be removed. News sources and analysts also indicate that the Xiyang incident wasn’t an isolated case and that significant friction exists between Chinese companies and their DPRK associates. The main long and short of things is that there is a risk for companies operating in the DPRK and that Korea Bay could be a tense topic for the two countries. High-value industries such as rare-earth and other mineral mining along with petroleum extraction could benefit the DPRK’s economy, if the DPRK actually had the technology and training to properly exploit their own raw material wealth. If Xiyang’s accusations are true (which is questionable), then the DPRK may be showing its willingness to risk straining PRC relations for a vital internal technology boon. This isn’t to say that the DPRK is going to spontaneously cancel their contract for political and economic reason and try and steal CNOOC’s gear, but it is to say that it is, more realistically, a source of potential friction between the two. Korea Bay isn’t necessarily catalyst of conflict that the South China Sea oil fields are, but it, much like the other PRC companies extracting minerals in the DPRK, is a potential source of friction and disagreement between the two countries. Something to watch in the future. This entry was posted in Iron and tagged Bohai, Corrections, DPRK, Drilling, Energy Security, Korea Bay, Offshore Drilling, Oil, Petroleum, PRC, Xiyang, Yellow Sea. Bookmark the permalink.